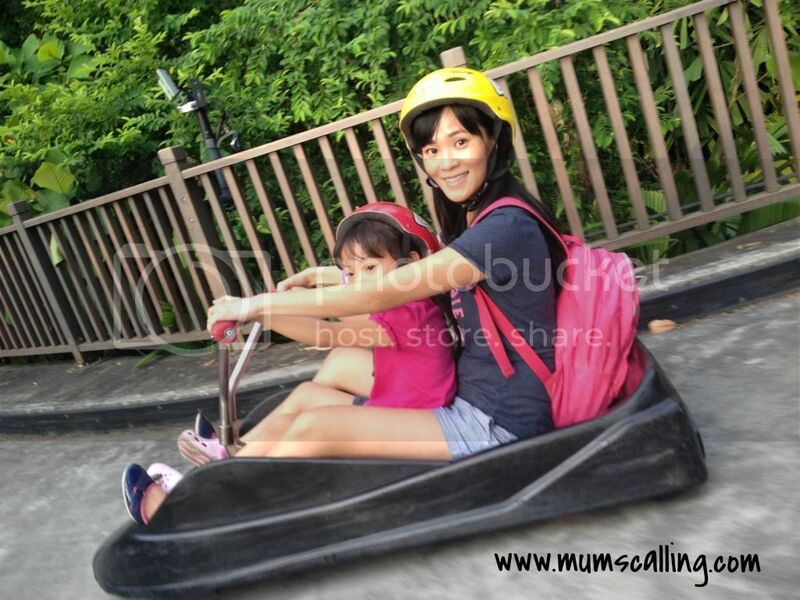 Mum's calling : Race to 10 million - Skyline luge Sentosa! 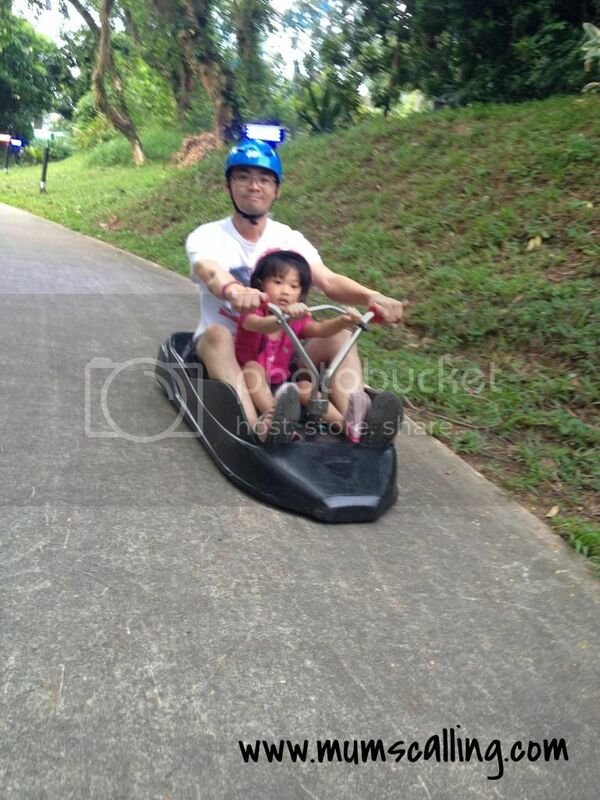 Have you tried the skyline luge in Sentosa? It always amazes me how Sentosa transforms and set in some of the best family activities in town. The luge is a unique wheeled gravity ride that provides riders full control over their descent on purpose built track. These luge carts provide riders with full control over speed and direction using a unique braking and steering system. We tried it some months back after winning a giveaway from lil blue bottle. Thanks for hosting, Lyn. The experience was out of this world! It was such a thrilling and fun experience that it got us all hooked. I testify that their tagline, 'once is never enough' isn't just a statement, but authentically true! Js asked for more, but sadly, we had to go. Fun always come to an end. The skyline chairlift brought us to the start point of the luge tracks. And woah, I didn't think height phobia was that serious on me, I was stone still up there. The man and kids were all composed about being high off ground. Since fear and height had no correlation to them, they sat back to enjoy the magnificent view and breeze. Oh well, practice makes perfect, our second ride up was much better. I was all at ease. 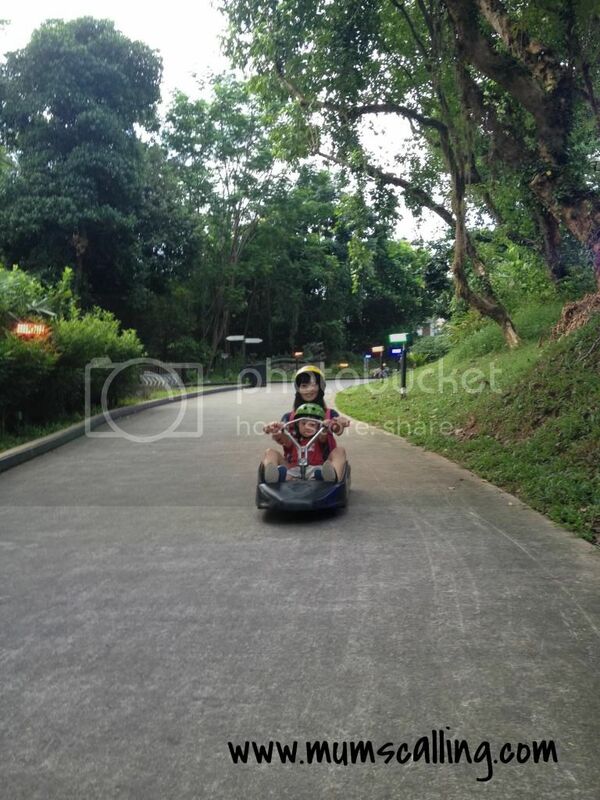 Our highlight was of course the luge. A ride that requires no license, but drive safe. I witnessed a rider zoomed like a flash, with the next moment flipping out of his luge. Don't belittle that loaned safety helmet. Little children below 6 years old and 110cm will not be able to ride on their own. This explained our 2 tandem teams. 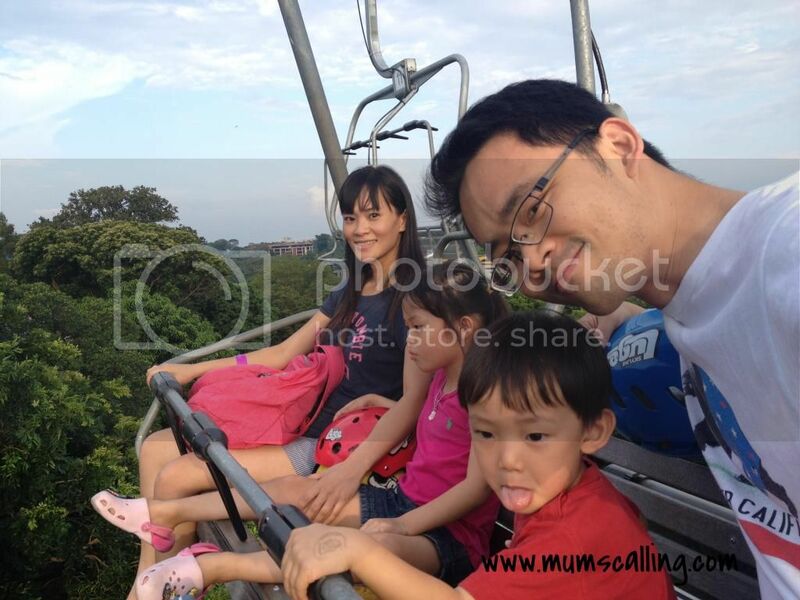 Our experience was extraordinarily fun, so much so that I asked the kind people from skyline luge to extend their blog giveaway for Mum's calling. Thanks Jabin! And trust me, it really is some fun that should not be missed! The reason why this post is so post dated (my fringe has since grew) was because the guys in Skyline Sentosa luge thought you shouldn't miss out some good news together with this. 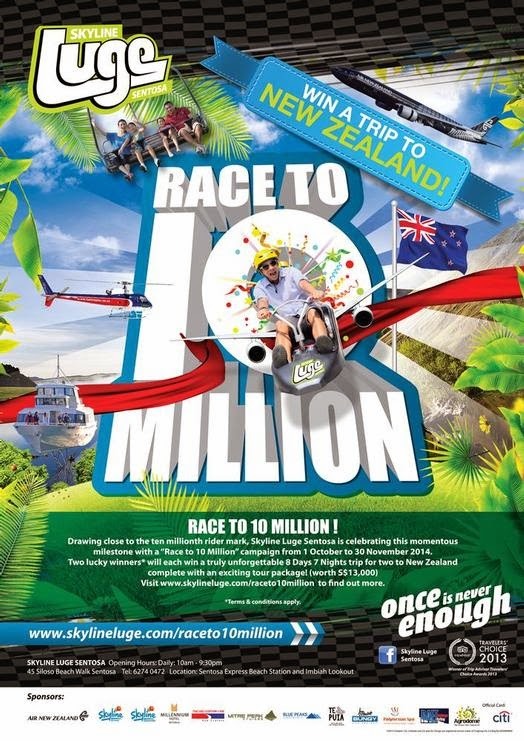 Be the actual 10 millionth rider visiting Skyline Luge Sentosa! Be the Lucky Draw Promotion winner! a) Each set of Two (2) X Five (5) Luge & Skyride combo tickets [total retail price at $66], purchased in a single receipt allows a Participant to have One (1) chance / Form of entry for the Lucky Draw Promotion. b) Each Family Ten (10) ticket, [retail price at $69] allows a Participant to have One (1) chance / Form of entry for the Lucky Draw Promotion. More details about this campaign here. This certainly sounds like the best time to make a trip down to race soon! While you decide when to make your trip down, after getting your 10 millionth rider instinct to work. Here's an appetizer - Join our giveaway, 2 sets of family four ride pass up for grab! (1 winner each). To take part, simply enter the following steps in the rafflecopter widget below. Do ensure you've completed at least steps 1 to 3 in rafflecopter to qualify. Step 4 gives you additional winning chances. Good luck! To be fair to our sponsors, please note that all fake Facebook accounts (eg. accounts set up purely to take part in contests with no or very few real friends) will also be ineligible to win."